Looks like BoJo may start the season at 174. If Kenny Courts can't get down, odds are that he'll go 197 and Mark Martin will redshirt. I always felt Courts was a huge 184; just can't see him dropping to 174. If anything, figured he was going up with Martin possibly taking his spot. I am a huge Buckeye fan, but 149, 157, 165, 197 and Hwt, are all big question marks. I hope they challenge, but everything would have to come together perfectly. Lots of question marks for OSU, but I think anyway you slice it, MU takes this one early on. March might be a different story. Mizzou as always looks great as a dual team. 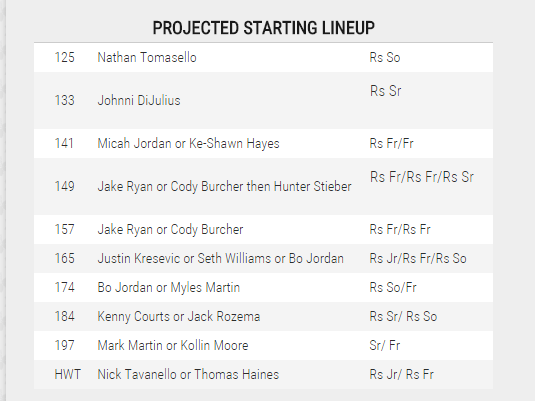 even if Kyle Snyder was in the line up this season I could see Mizzou coming out ahead. 149: LaValle at 149 really interests me. He was always on the bubble at 157 and a little undersized, so I think he could challenge for an AA spot this season (6-8 range). He takes it here by Dec. 7-6 tOSU. Any word on how Leeth does against LaValle? Could he be the starter instead? I think bonus points may be the decider here. This is a very competitive dual again this year on paper. I might have to make the trek to Mizzou to see this one play out. I think this will be a tale of two seasons for Ohio State. The early portion of the season will have a hit-and-miss line-up. This will restrict fans (or us onlookers) from getting a good sense of what the team is capable of. I suspect as the conference event draws near, the coaching staff will make decisions to put the team in place to maximize points. I just do not see the best line-up Ohio State can muster cracking the top three in MSG. PSU, Oklahoma State, and even Iowa appear to be the front-runners. I don't think Butler vs. Jordan is going to be a competitive match. In the second half of last season, Kenny Courts learned that he could be trailing and win. TOSU fans should have big hopes for him this season, while opposing fans don't. If i remember correctly, he had a very poor Big Ten tournament and barely qualified prior to shocking everyone and making the semifinals. It's a bit misleading to say he learned this in the second half of the season. Maybe he has found something that he previously did not have, but he wouldn't be the first person to surprise in the NCAA tournament and then come back to reality the following year. Absolutely there will be many doubters. No problem. My personal opinion is that he won a mental battle against fatigue and it showed in his later competition third periods and overtime, but especially compared to last year. I fully expect he will build on that and be even better this coming season. I'm content if only a few have the same opinion, since I may have a bad read on the whole situation. We shall see. This happens every year to somebody. Internet prognostication at its finest. BoJo is a different level of talent. Devin Carter would be a great example of this! Butler is terrific and I think it's a big mistake for anyone to assume BoJo will dominate him. BoJo was very good at NCAA's but had some close matches during the season. He may pick up right where he left off....but he may not. It doesn't always happen that way. And it's a dual...where anything can happen.